Enjoy the rich shades of kingfisher blue, jade and emerald green combined in a chrysocolla bracelet. 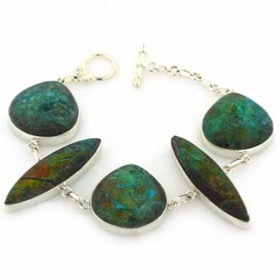 Stunning combined with sterling silver, your chrysocolla silver bracelet will never be off your wrist. Check out our chrysocolla pendantcollection. Our chrysocolla bracelets feature natural stones. 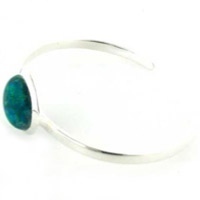 Shop below for a silver chrysocolla bracelet or a chrysocolla bangle.